Partnering to promote, protect and preserve health in our community. Integrity: We are honest and trustworthy. Respect: We are mindful of everyone; treating others with kindness and understanding. Accountability: We take responsibility for our actions and obligations. Teamwork: We work together to support individual and organizational success. Excellence: We strive to surpass expectations in all we do. Our team strives to put its Core Values into action in every interaction with the public and within our team. Our Core Values in Action document provides a guide for our attitudes, behaviors, decision-making, performance management and relationship building. Check out our Core Values in Action, HERE. 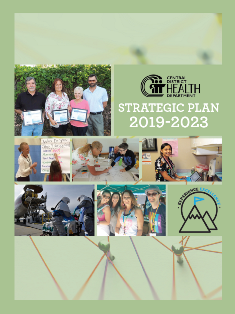 This strategic plan is a living document and focuses on goals and objectives for fiscal years 2019 through 2023. The plan will undergo annual updates in order to refine goals and objectives. The intent of this approach is to maintain momentum towards achieving CDHD’s vision. Goals and objectives, which touch upon the major functions of CDHD, have been developed under each of the strategic priorities. The goals are broad and often span across multiple programs or divisions. They define what CDHD hopes to achieve toward each priority. The goals are supported by quantifiable objectives, often set at the program level. Strategies describe the methods which will be employed to attain the goals and objectives, and measures define how progress will be tracked. Decrease risk factors for chronic diseases. Improve the quality of life and increase the years of healthy life among residents in the counties of CDHD. Protect the public's health by minimizing the impact of infectious diseases and environment-related illnesses.